A four piece alt-country band from Philadephia, Red Means Run take their name from the Neil Young classic ‘Powderfinger’ and on their debut EP, guitarist Jim McKay adds a couple of solos that have the same carefree/off-key approach of the great man himself. If you love Neil and his naturalistic style of playing, of course, this is no bad thing…and it certainly suits this ragged quartet’s take on country rock. Also inspired by Young and the earlier forebears of alt-country these chaps don’t really worry about layers or overdubs – the four songs on this release have a very direct feel, almost as if the band were playing in a bar somewhere. Lolloping along at a happy midpace, ‘Walking Papers’ typifies everything that’s enjoyable about Red Means Run’s take on rootsy alt-rock. The rhythm section adopt a steady, stomping beat, while the guitars quickly fall in line simple rhythm. The lead guitar occasionally rises up in the left channel with some naturalistic leads, while lead vocalist Ryan Wells sounds comfortable, with a slightly wobbly voice befitting the homespun groove. Tapping into something that straddles fine line between rocky and retro, listeners may hear hints of ‘Ghost Is Born’ era Wilco nestling with the kind of rhythmic structures and melodies that filled the major label Soul Asylum discs, but in truth, these guys sound so much more like The Great Affairs than anything. A little tougher, ‘Hard Livin’’ is a country rock show case that teases with power pop hooks, while McKay wastes no time in delivering more chunky lead breaks – in fact, in this instance, he’s there front and centre wandering around his fretboard even before the lead vocal puts in an appearance. Not too stylistically different from ‘Walking Papers’, this is solid enough…though perhaps the vocals could be a touch tighter all round. While the rockier tracks are fun, it’s when turning to something slightly more country when Red Means Run start to reach their fuller potential. ‘When All Things Are Said and Done’ stokes up the country in their country rock, with finger picked guitars rattling, lyrics about drinking your way out of the gutter and a couple of worse-for wear harmonies. An unfussy guitar lead dominates its mid section, with McKay hitting notes in a loose manner, the sloppy edges really underscoring the lyrical themes of this particular piece. Taking alt-country about as far as it can go without becoming actual country, the stripped back shuffle of ‘Some Became Nothing’ shows this quartet at their finest. Unlike on parts of ‘Said and Done’, the slightly wobbly vocal sounds absolutely at home here, adding to the all round sense of unease, while finger picked guitars thunder the country vibes along at a great pace. If you were unsure as to where Red Means Run’s core influences are taken, this tune makes no attempt at hiding their love for Uncle Tupelo’s ‘No Depression’ album, with the aforementioned vocal being only a small step away from Jay Farrar’s distinctive, genre-defining shout (though quieter, naturally). Throw in a little harmonica and this is a top four and a half minutes. These four songs – although possessing a few rough edges that time and money could improve, though perhaps the band would prefer to leave as is – are enjoyable, good time affairs. Sure, the lyrical content isn’t always chirpy and the vocals aren’t always top notch, but within is the sound of a DIY band who sound as if they’re having fun..and the tunes come tailor made for those who like The Great Affairs, The Die Youngs and their ilk. 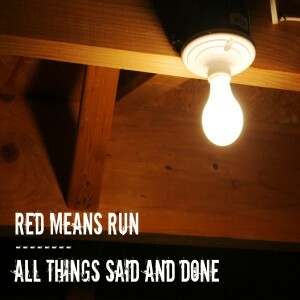 This entry was posted in Album & EP Reviews and tagged americana, red means run, retro, stream, the die youngs, the great affairs by Real Gone. Bookmark the permalink.